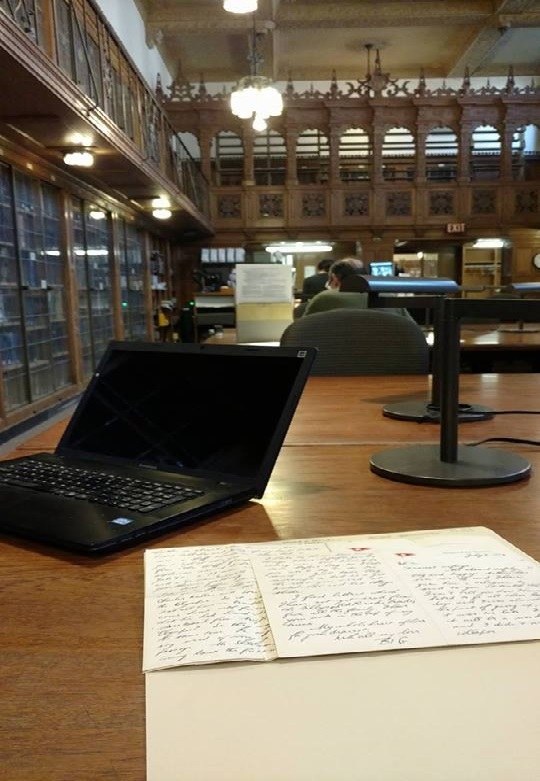 As part of his thesis research on the evolution of the American University Union in Europe, History Master’s student, J. Cameron Mills, traveled to the Sterling Library in New Haven, Connecticut to look at the letters of George Nettleton and eat pizza. Discussing the attributes of the best pizza place in New Haven, Connecticut was NOT what I had gotten my travel award from the NC State History Department for. But like it or not, it was the #1 topic of interest for those who worked at or near Yale University. Initially my goal upon arrival after an all day train ride from Raleigh HAD been to get a good night’s sleep, walk over to Sterling Library and begin poring over letters and other primary sources for my History thesis. But all the locals, including Michael in the research room at Sterling who gave me a list of recommendations, wanted to talk about was pizza and EVERYONE had an opinion on which pie place was the best. But for the record, I did much more than just eat pizza in New Haven, I had a great experience delving through primary sources with the able assistance of the pizza loving research librarians at Yale. They were more than accommodating in setting aside boxes and folders before I arrived, then schlepping down and pulling them for me as needed. And as anyone who has had a chance to hold letters and newspapers that are a century plus old, it’s an experience that’s hard to describe or forget. And none of that would have been possible without the travel award from NC State and the History Department. My focus in New Haven was the personal and professional letters of George Nettleton, a Yale English Professor who during World War I headed up an organization called the “American University Union in Europe.” The AUUE was formed to serve as a place of relaxation in Paris and London for US college men serving overseas during the war. Fortunately for my research Nettleton wrote voluminous letters to his wife and friends detailing his struggles to ensure those fighting in Europe had a place to unwind during their all too short periods of leave. Also fortunately like all gifted letter writers and though he wrote these a century ago, they are in turns detailed, bright, funny, pleading and (with his wife) affectionate and teasing. At a personal level, though Professor Nettleton passed away before I was born, his letters make me wish I could go back in time, meet him, have a glass of wine and discuss the state of the world, then and now. I’m sure the conversation would be illuminating. So what else did I learn beyond my library research at Yale? First I learned I enjoy the local delicacy, but in New Haven, you must pronounce it “apizza,” with a very soft “p” pronounced almost like a “b,” and a silent “a” at the end. I am sorry however I can’t tell you much more because my actual foodie experience was limited to a single visit to a pie parlor. Note of Thanks: In addition to the accommodating research librarians at Yale’s Sterling Library, many thanks to my high school classmate Laurie and her husband Stephen who took me to Modern Apizza AND taught me the various pronunciations though they were helpless to reform my Southern accent. Any factual or parochial mistakes in this article are purely my own responsibility.